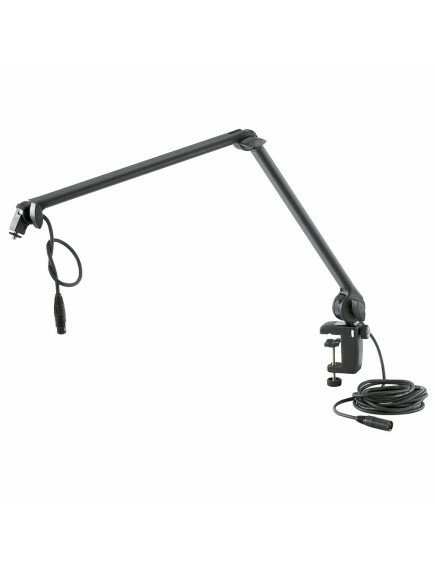 Our popular, smooth-running microphone desk arm with 3/8" or 5/8" thread connector for sound studios and multimedia work stations with a new innovative table clamp. Easy to position and suitable for microphones to max. 0.8 kg. The 5 m long microphone cable with a 3 pin XLR plug connector is included in the delivery. Having a clamping range of 0 to 48 mm the clamp is suitable for a wide spectrum of mounting. The stable metal construction with high quality plastic inserts guarantees secure and strong hold. The cleverly shaped clamping parts allow the clamp to be used on smooth surfaces and round-shaped tubes. The microphone arm can also be fixed with the table flange 23855 available as an optional extra.